The term autophagy means “self” (auto) “eating” (phagy also refers to phagocytes which are immune cells that eat debris and microbes). Just this week the Nobel Prize for Physiology or Medicine was given to the scientist who first discovered this process in yeast a generation ago—Yoshinori Ohsumi. Later, it was found to be a fundamental part of all cells and vital in the eukaryote and human cells. It is not only part of the major waste disposal and recycling process described in the last post on lysosomes, but is critical in the cell’s response to stress, starvation, inflammation and infection. Autophagy becomes more active in regulating the action when there is a problem getting the proper amount of nutrients. It is also vital in cancer and brain diseases. Effective autophagy helps us live longer and defective autophagy can increase aging. Autophagy responds to stress and increases survival but can also lead to cell death, the opposite. In the original research on yeast, Dr. Ohsumi noticed that when starved, yeast produced many very large sacs called vacuoles. Vacuoles were described in previous posts as vital to recycle material and eliminating waste. These enlarged vacuoles became so large that he could see them with a light microscope. 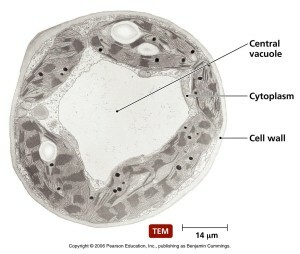 Vacuoles were also described in a previous post as a place that some microbes are able to make their home inside the cell. In starvation it helps keep energy levels and provides necessary material. As described in the previous post on lysosomes, autophagy is a complex process with many vital proteins and therefore mutations and problems can occur in many different ways. They are therefore related to a large amount of different diseases including cancer, diabetes, Huntington’s disease and other brain diseases. Autophagy is a process that takes apart all kinds of cellular molecules in a programed regulated manner. These molecules include cellular parts that are defective and molecules that need to be recycled to build other components. It also takes apart cancers and microbes. These targeted molecules are separated by a double membrane in vesicles—either the lysosome or a special vesicle for autophagy. There are, in fact, three kinds of autophagy and the most common type uses a large vesicle. 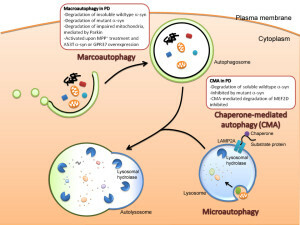 The two lesser known types are called microautophagy and chaperone mediated autophagy. Microautophagy is where the process occurs using the lysosome membrane, where material is engulfed by the lysosome. The second type uses chaperone molecules in the endoplasmic reticulum to engulf material. 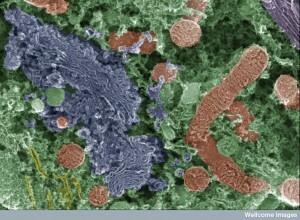 A special complex of molecules brings the tagged material to the lysosome. The chaperone unfolds the protein to enable transport into the lysosome. The predominant type—called macroautophagy—uses a special vesicle. This vesicle for autophagy has a strange name by adding “osome” to autophagy—autophagosome. This vesicle then fuses with the lysosome for destruction of material. (see post on lysosomes for the details of the vital intelligent organelle). Sometimes the latter uses ubiquitin tags (see post). This material is eventually brought to the large lysosome factories. In humans, the starvation autophagy response occurs just after birth when the placental food supply is cut off. Some research shows that the life extending effects of restricting calories is related to effects of autophagy processes. During exercise, autophagy is vital in maintaining muscles. With microbes and other products of infection, autophagy works with immune cells. Both tuberculosis bacterium and mitochondria that have problems are both targeted in the same way. This implies that mitochondria were once microbes. 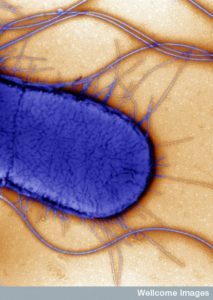 Some microbes are able to block the vesicle from fusing with the lysosome (see post on Microbes and Cells Fight over Vacuoles). Some viruses and bacteria are able to commandeer the autophagy process to help their own reproduction. Cancer can occur in a variety of ways related to the way duplicate and the way stem cells determine what type of cell to produce. Autophagy contributes to cancer by helping starving cancer cells to survive and stopping programmed cell death. But, it also suppresses cancer. Autophagy is more than a waste disposal. This complex process that recycles material of all kinds sits in the middle of vital pathways related to inflammation, immunity and cancer. As with most cellular functions, it signals to immune cells to promote specific kinds of inflammation to fight infections and cancer. In its own vesicle it also fights cancer locally by helping to find pieces of cancers (tumor antigens) and present them to immune cells. Cancers fight back by slowing the process of autophagy, but they often need it as well. It is highly involved in getting rid of waste, but also dealing with stress at the cellular level. Both autophagy and lysosomes are very complex. They are involved in recycling of materials but are also a hub of communication in the cell. 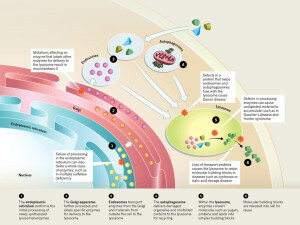 The major type of autophagy that produces the autophagosome is vital for the function of other organelles in the cell. When danger molecules are identified in the cell macrophages produce inflammation. Autophagosomes keep this from getting out of hand. Mitochondria when stressed can trigger large inflammation, which is contained by autophagy in the mitochondria, a process called mitophagy. This destruction of particular mitochondria controls possible destructive over reactions of the immune system. 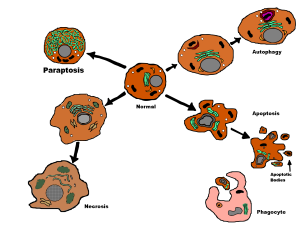 Autophagy is a process with five steps. The vesicles are built around vital molecules, then “nucleated” or activated, enlarged, fused with lysosomes and degraded. Many factors affect this five step process—obesity, aging, alcohol, inflammation and infections. Usually these factors alter the beginning and end of this process. When autophagy is disrupted, then cancer can develop more easily. Disruption affects genes that normally suppress cancers. In fact, once cancer is established, autophagy helps the cancer by producing usable building material. But, more generally more autophagy produces more anti-tumor immune responses. With less autophagy, cancers can avoid the immune attacks. Genes that help produce cancers (oncogenes) stop autophagy. Yet another factor in cancer development is that in the cancer center there is little oxygen and other materials. This activates immune cells. By increasing autophagy this immune response is less, damaged mitochondria are removed, and more nutrients are provided for the starving cancer cells. This is all very interrelated, complex and not clearly understood. One type of inflammation helps cancers grow and is caused by autophagy defects in immune cells. It also stops autophagy from presenting the cancer material to the immune system (antigens). Many microbes that cause cancer (Helicobacter pylori, Epstein-Barr virus, and Herpesvirus) avoid autophagy through various mechanisms. Microbe proteins alter lysosomes to not be able to help autophagy. In all three cases, molecules both inhibit autophagy and increase the development of their cancers (gastric and liver cancers). Other microbes don’t have proteins that produce cancers, but rather stimulate particular types of inflammation that cause cancers (inflammatory bowel disease, ulcerative colitis, and Crohn’s disease, increase colorectal cancers through cytokine signals.) These all involve altering autophagy and lysosomes. Chronic pancreatitis is an infection related to impaired autophagy and can cause pancreatic cancers. The effect of alcohol consumption on autophagy is part of this picture. This also leads to hepatitis. The metabolism of the large amount of alcohol interferes with a vital kinase enzyme and disturbs autophagy. It also causes mitochondrial damage, which kills liver cells and causes inflammation. With poor autophagy in the immune cells damage to the liver increases. Autophagy is necessary to control excessive fat in liver cells and avoids fatty liver damage. Obesity inhibits autophagy with many different mechanisms. Several affect autophagy itself, some stop the fusion with the lysosomes by altering membrane fats. It also stresses the endoplasmic reticulum which produces cytokines and inflammation. Immune cell autophagy is also compromised. Old age affects autophagy and leads to less clearance of damaged mitochondria causing inflammation. More reactive oxygen and abnormal proteins accumulate. 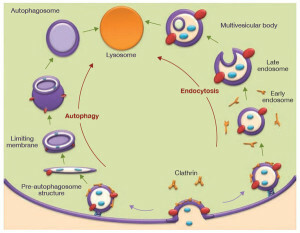 Many cytokines are triggered by damaged autophagy. Autophagy lowers the types of inflammation that cause cancer. As well as increasing cancer, this type of inflammation causes damage to tissues. Inflammation is a double edged sword that increases tissue repair, but in excess damages tissue. Autophagy is the vital regulator of this process. Autophagy produces the balance of not too much or too little inflammation and then back to normal afterward (homeostasis). There is another way that autophagy stops inflammation that can cause cancer. This pathway involves the autophagy response to microbe inflammation (called xenophagy). After infection of many dangerous microbes the xenophagy process is stimulated, killing microbes. Just like damaged mitochondria, autophagy notices the microbes that are inside the cell where they aren’t supposed to be. Part of this mechanism involves a response to the fight that occurs for energy and nutrient molecules between the microbes and the cell. An interesting observation is that the autophagy response to microbes and mitochondria are similar because mitochondria were once microbes that invaded the cell. This makes the mechanisms whereby autophagy controls inflammation very ancient. 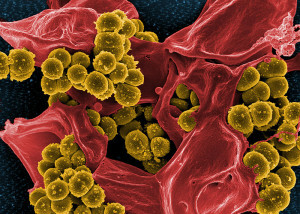 Pieces of unwanted material from outside or inside the cell (microbes, tumors or debris) trigger T cells. Autophagy processes aid the presentation of appropriate molecules to T cells. These antigen triggers are passed along in the autophagy secretory vesicles and routed to T cells. 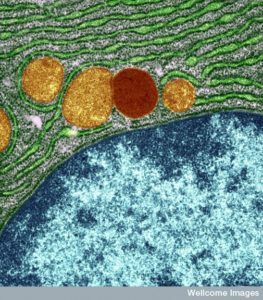 When the cell is very stressed such that the normal endoplasmic reticulum mechanisms of tagging can’t be used, autophagy vesicles take up this task. Another way autophagy helps is to release molecules from inside of cancer cells to make them available for immune responses. Autophagy also is involved in the process whereby T cells are trained to respond to appropriate antigens—their education in the thymus. In fact, for a T cell to graduate from their training into an active activated cell, they must have functioning autophagy as one of the requirements. It also influences T cells to produce specific cytokines that can increase or decrease inflammation. When autophagy is not working in liver cells, liver cancer is the result. Autophagy increases immune responses while at the same time increasing immune processes in T cells that stop cancers. 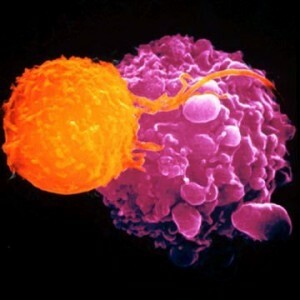 Many treatments have been developed to increase the effectiveness of T cells against cancers. Cancers are very clever at avoiding immune attacks. 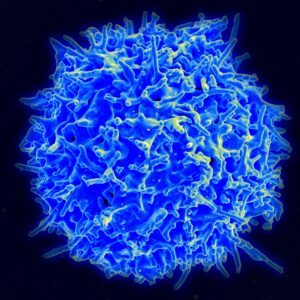 They signal to T cells in various ways to make them less effective. One of the ways autophagy deals with cancers is to trigger cell death pathways. Some of the current immune treatment for cancer indirectly trigger autophagy through very complex pathways causing cell death to the cancer cell. This type of cell death causes inflammation and immune responses (ICD or immune cell death) unlike the type called apoptosis that does not (apoptosis is a programmed cell death that does not trigger immune responses). A number of the newest cancer treatments (anthracyclines, mitoxantrone, oxaliplatin and cyclophosphamide) trigger this autophagy cell death pathway that does cause particular types of inflammation. Radiotherapy also triggers it, as do viruses that cause cancers (herpes, coxcacki and parvoviruses). ICD is regulated by the autophagy process. Dying cancer cells produce a molecule that is a signal for the cell to be eaten. They are then picked up. Another “eat me” signal is the release of ATP, the energy particle. Autophagy is more involved in these processes. It actually induces the release of these special antigens that produce the “eat me” response. 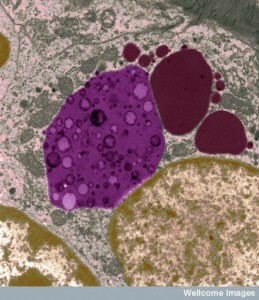 Autophagy clearly fights early cancer development. But in well advanced cancers there is a question as to whether autophagy can both fight the cancer and possibly help it. Autophagy helps produce cancer antigens, that trigger immune responses. Recent studies have not shown that treatment with inhibitors of autophagy help treatment of cancers. But, it is not easy to find treatments that will stimulate the helpful aspects of autophagy. Some common medications inhibit enzymes that repress autophagy (that is, inhibit the inhibitors of autophagy and help autophagy). These agents that help are metformin, biguanides, and rapalogs (inhibitors of mTOR). These treatments help in some models of aging and cancer. Starvation and calorie restriction agents can help as well. Autophagy helps trigger particular T cell responses, but it is not yet clear how to increase this effect. Like many cellular processes described in this series of posts, it is hard to understand where the direction comes from. The large secretory pathway in the cell produces all membranes, vesicles, and compartments in the cell. It is a distributed network. In the midst of this extremely complex network regulated by the endoplasmic reticulum and Golgi, complex molecules are produced targeted, tagged and transported. But, they are also disposed of and recycled. The two integrated processes—lysosomes and autophagy—are vital in the destruction and recycling, but also so much more. Autophagy works in many places at once and appears to be highly organized and regulated. It is difficult to imagine where the direction of this highly complex and intelligent system resides. This entry was posted in Blog, Neuronal Plasticity, Cellular Intelligence and tagged autophagy recycles molecules, Autophagy can help cancer, autophagy can fight against cancer, autophagy can cause particular types of inflammation. Bookmark the permalink.